Halloween is coming! For the most terrifying night of the year, I created a recipe, sweet, and spicy, and tasty at the same time. 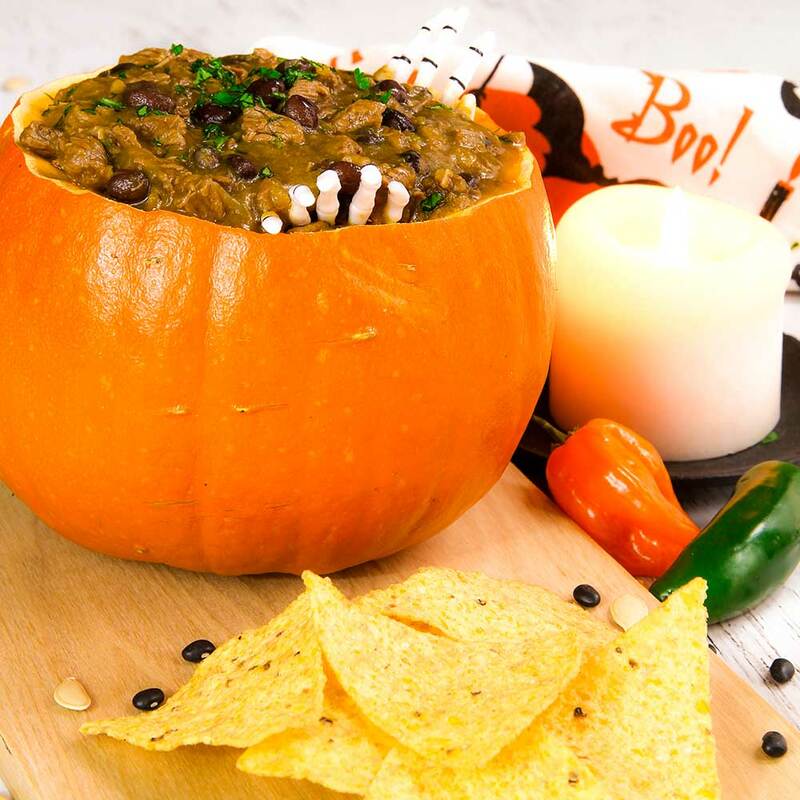 Try this particular pumpkin chili with black beans, it is monstrously good! 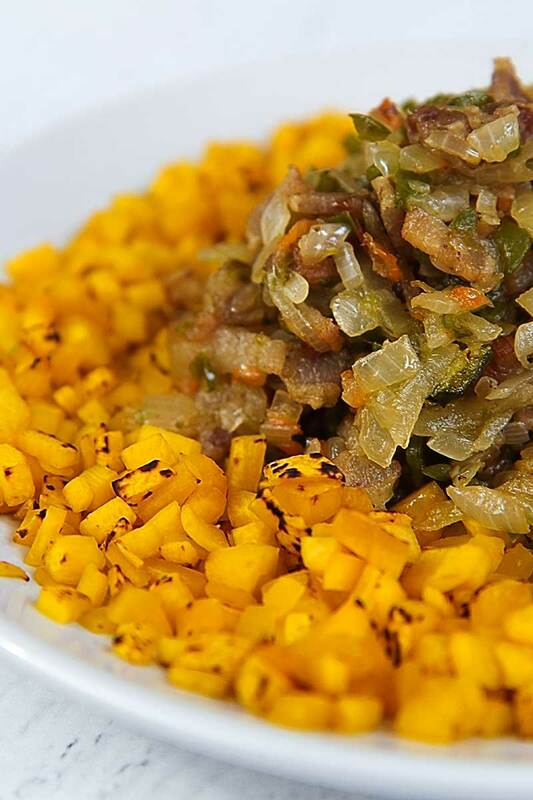 To prepare this flavorful pumpkin chili, wash and dry the vegetables and the meat. 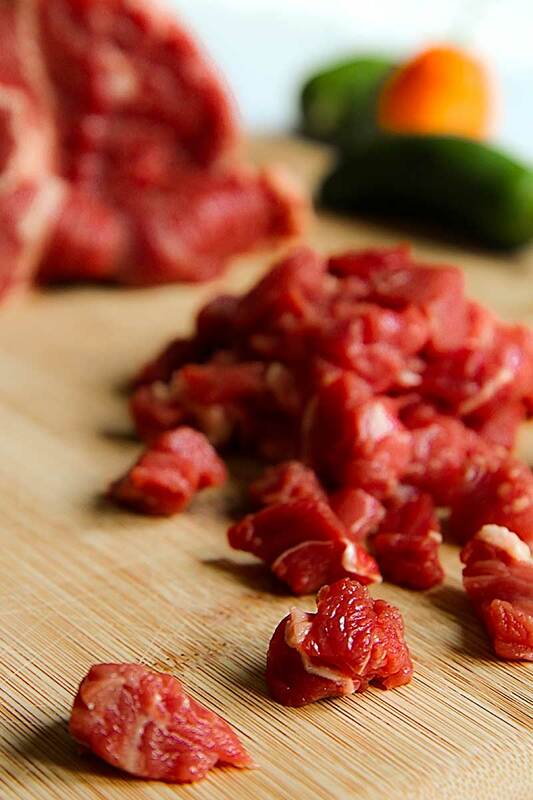 Cut the chuck roast beef into ¼ inch cubes and place into the fridge. Peel the pumpkin and dice into very small pieces. Cut the jalopenos and habanero in half, and eliminate the seeds. Finally, mince the onion. Place a nonstick skillet over high heat. Pour into the pan the peppers, stirring frequently until nicely toasted. When the peppers are ready, mince them and place into a bowl. Then, pour the pumpkin in the same pan. Roast the pumpkin until it is crispy without being overly burnt, then place into a bowl. Cut the bacon into strips about 1/4 inch wide. Pour the bacon in a enameled dutch oven or a thick-bottomed nonstick pot. Cook the bacon over medium heat until the fat has melted and the bacon will become crisp. Now, pour into the pot the minced jalopenos and serrano, raise the heat slightly and stir-fry. After a few minutes, pour the onion, stirring frequently. When the onion is soft and translucent, add the meat, raise the heat to high and cook, stirring frequently. Once the surface of the meat is cooked, pour the pumpkin. Continue cooking over high heat for a few minutes, then pour the beer. When the beer starts simmering, set the heat to low, cover the pot and cook over low heat for 3 hours (the pumpkin chili has to cook very gently simmering covered). 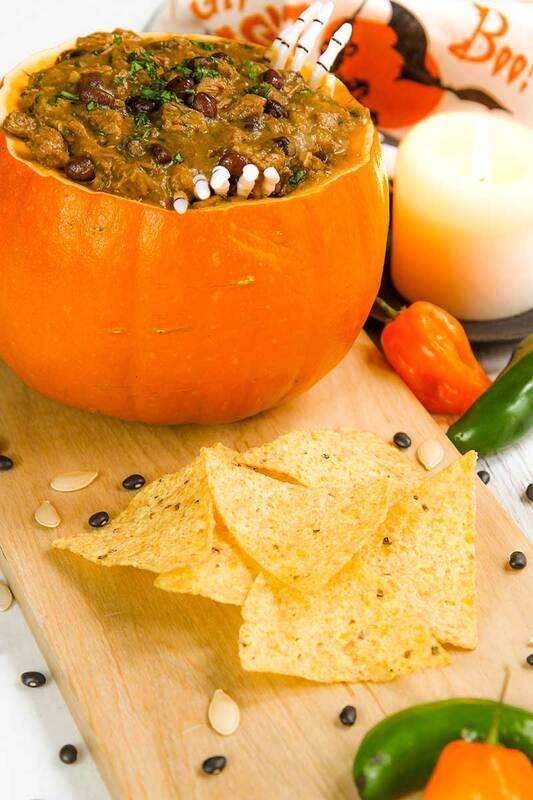 PUMPKIN CHILI ON YOUR TABLE! 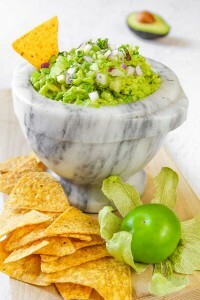 When the meat is soft and juicy, add the canned or homemade boiled black beans. Cook the pumpkin chili 30 minutes more then, let it rest covered at least 20 minutes before serving. We can keep the pumpkin chili into the fridge a couple of days before eating it, or freeze up to 6 months. Cut the bacon into strips about ¼ inch wide. Pour the bacon in a enameled dutch oven or a thick-bottomed nonstick pot. Cook the bacon over medium heat until the fat has melted and the bacon will become crisp. 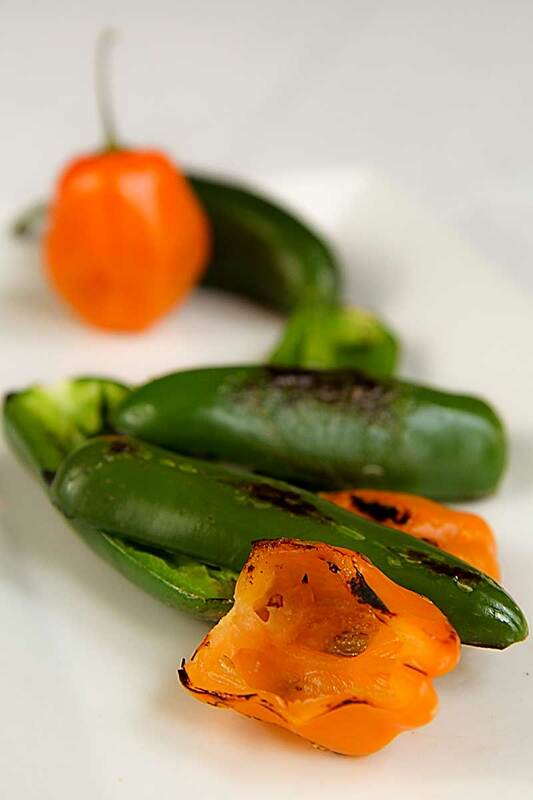 Now, pour into the pot the minced jalopenos and serrano, raise the heat slightly and stir-fry. After a few minutes, pour the onion, stirring frequently. When the onion is soft and translucent, add the meat, raise the heat to high and cook, stirring frequently. Once the surface of the meat is cooked, pour the pumpkin. Continue cooking over high heat for a few minutes, then pour the beer. When the beer starts simmering, set the heat to low, cover the pot and cook over low heat for 3 hours (the pumpkin chili has to cook very gently simmering covered). « ITALIAN RICE AND BEANS SOUP – a fall delight!